It’s just three weeks until the International Yoga Conference and Festival at Kawai Purapura so I took the opportunity to have a chat to one of the many highly respected yoga teachers who will be at the festival – Swami Shantimurti. 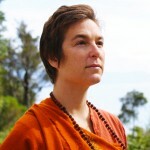 Swami Shantimurti is the senior teacher at Auckland’s Ashram Yoga. He’s been teaching since 1978 and has seen the growth and change of yoga in the West. According to the bio on Ashram Yoga’s website, Shantimurti has spent extend periods with highly accomplished yogis and seen many wonders. He has managed a number of ashrams over the last 35 years and seen many of the unusual situations that sometimes come with advanced yoga practice. 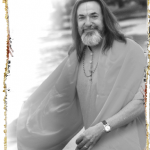 He has trained many sannyasins, yoga teachers and students. Shantimurti lives at the Ohui Retreat Centrein the Coromandel and travels teaching yoga in Auckland and internationally. Because of his depth of experience, I just had to ask the Swami about Yogawoman (got your ticket yet?). I wanted to know whether or not yoga had always been a male practice. Surprisingly, he hadn’t heard of the documentary. However, I read him out an extract from the press release, and you can listen to his response in the videos below. – The true origins of Yoga in India as both a male & female practice, especially in the Tantric lineages. – And why the world doesn’t need saving. 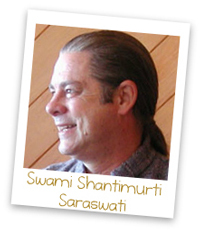 Swami Shantimurti is appearing at the International Yoga Conference and Festival April 27th – 29th. Swami Ji, born in NZ, gives the low down on how a Kiwi boy became a Swami, and how the wisdom he speaks of is relevant to your every day Kiwi bloke and blokini. See tour details here... Swami Ji NZ Tour 2011. Love the interview! Great questions, answers and content! It was such a pleasure to interview Shanti… could have kept talking for a long time! Awesome! So fantastic to watch this interesting interview…and especially to see my amazing teacher, Shanti. You have given me so much Shanti, thank you. (The sadhana is working well.) Hari aum. Kara-Leah. I am one of your neweez to the Lunchbox… I absolutely love your talk blogs videos… mainly because I relate to every word you have said so far and look forward to more, more more… wish I had known of you long time ago.. never mind Im here now and say thankyou. Also thankyou for the interviews you have done with my teacher Shantimurti; will enjoy the rest to come also.. Hari om.. Terimoana in a mining town of Kalgoorlie W.A. Welcome! And I love your word ‘neweez’… fabulous. It’s wonderful to receive feedback from people, and to know where you are too. The video blogs are going to keep on rolling, plus I’ll be doing more Skype interviews with fabulous teachers like Shantimurti. And I gotta ask… what are you doing in a mining town of West Australia, and is there any yoga there?